A craft. I know. Seriously? But this one has been so fun to make, and so pretty I had to share it with all of you!. Look how pretty in my dining room it looks! And, coming from this non-crafty person, you know it has to be easy! And what a perfect gift to give someone. Roll it up and tie with some pretty ribbon. Give it with a batch of eggnog truffles or chocolate peppermint biscotti and you have one perfect present! So here’s what I did (and thanks to Kari and her MOPS group for this fantatic idea). Cut a strip of burlap the desired width and length of your table. Mine is 15in x 68in. Make sure when you are cutting, you cut along one line of string. Seems like a pain, but will make it easier to fringe. Okay. So you’re done cutting it out. Now pull out a couple strings on all four sides so you have a nice little fringe. On your computer, print out words in different fonts. Each word should fill one piece of paper. For longer phrases do one word on each paper…it will make transferring them much easier! Okay. So now you have your stack of word sheets. Hang on to these, you can reuse them too! Remember, you can be creative here and use any words! I started at one end of my burlap and did both the end words (winter and friends). Using a black sharpie, trace the word by placing the sheet of paper under the burlap. You should be able to just make out the word. Some fonts will be a little harder than others! Continue tracing words until your burlap is filled. You can put way more words on it than I did, but I have little patience and am lucky I even did this much! You can also add in symbols and pictures. Talented, I know! 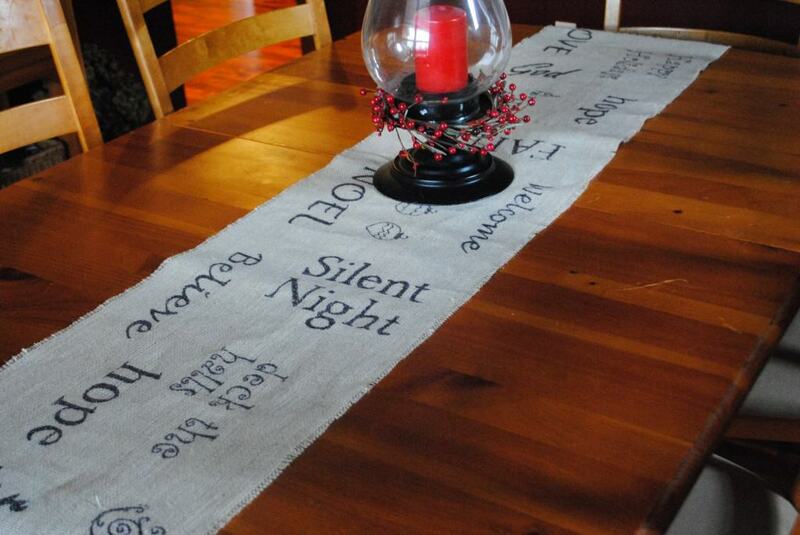 And there you have it, a timeless holiday table runner that cost less than $2 to make! I cut my original piece of burlap into three strips…then made one for myself for Christmas, one year round version, and one for my grandma. Enjoy! Oh, and if you have extra burlap, look what else you can do. A banner! (don’t judge the dirty mirror). Just cut equal sized squares (or triangles) out of the burlap, any size. Print off the letters you want. Trace each letter on a separate square. Then attach all the squares to twine using a hot glue gun. (yes, I own one). And there you have it. A craft. Here on ShugarySweets! Who knew? I think you have been hiding your other talents from us!!! Don’t try to tell me you aren’t crafty. I know better now!!! I think this is adorable and so super easy!!! I have a roll of white burlap just sitting in a box waiting for something to be made…now where did I put that sharpie? I love this! Using natural materials always makes everything looks so rustic. I really love the look! I am in love with this. I am, pinning it to feature this week! Thank you so much for being a part of the holiday spirit at Rook No. 17 last Tuesday. Can’t wait to see what you have to share today!